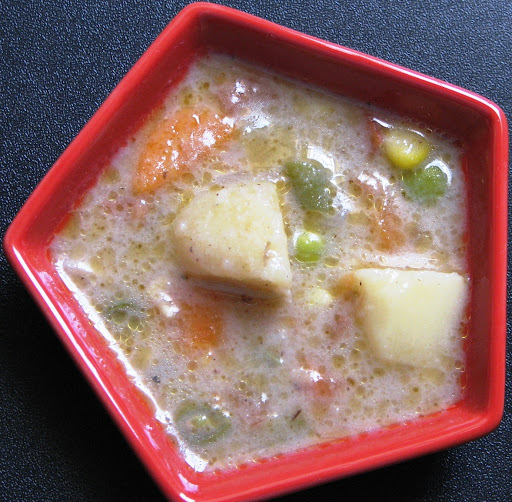 Here is the recipe for the vegetable stew. I used Potatoes, carrots, beans, peas and corn. Note that the amount of vegetables can be reduced and meat added instead. Vegetables: These can be substituted with meat like chicken or mutton as well. Even if Meat is used, the vegetables below are a must for the stew. Repeat the above step once again with the squeezed out coconut and warm water to obtain the second milk in a separate dish. Do it yet again to obtain the third milk. Heat 3 Tbsp oil of oil in a pan or wok.Put in chopped onions and green chillies and fry on medium flame till the onions begin to lose colour. About 5 min. Then add the ginger paste and stir continuously for another minute or till the raw smell of the ginger has gone. Add the powdered spice mix and roast for a couple of seconds. Add the Flour and crushed pepper and roast till the raw smell of the flour has gone which is for another couple of seconds. Then add the chopped tomatoes and stir for 5 min till the tomatoes have been reduced to pulp. Another option is to add cooked and mashed tomato directly in this stage. That way, you don’t have to stir for 5 min. Pour in 3 cups of water and the third coconut milk. If not using coconut milk, then add 3 and ½ cups water. If adding meat in the stew, then just add 1 cup of water as a lot of fluid will ooze out of the meat when it cooks. Put in potatoes, carrot and beans. Let the mixture boil and then close the lid and simmer on low flame for 15 min. If adding meat then simmer till the meat has cooked. Put in the peas and the corn and close the lid on low flame for another 5 - 10 min till all the vegetables are well cooked. Add the second milk of the coconut and bring to a boil. Those not using fresh coconut can skip this step. Taste again and adjust the salt and pepper. Then add the First milk of the coconut. Give it a good stir and switch off flame. Do not boil the stew after the addition of the first milk. In a tsp of coconut oil, burst a handful of curry leaves and pour it over the top of the stew. Optionally, slices of boiled egg can be added to the stew as well. Enjoy with thick slices of bread (brown/white) or with soft lacy appams. Verdict: We thoroughly enjoyed this stew with bread. More so, because I had made it for our small and newly started congregation for breakfast after the Sunday service. It definitely made a hearty meal amidst the lively conversation. @Liz: Good to see you here :) Let me know how it turns out.